Open data can support economic growth and social good around the world. To that end, this global resource needs to be developed and managed in ways that meet user expectations. To reach this goal, the Center for Open Data Enterprise seeks to develop smarter open data strategies based on user needs. “Open data is free, publicly available data that anyone can access and use, without restrictions. Open data can be used by businesses, nonprofits, governments and citizens to launch new initiatives and ventures, analyze trends, make data-driven decisions, and solve complex problems in all sectors of the economy” (What is Open Data? The Center for Open Data Enterprise). 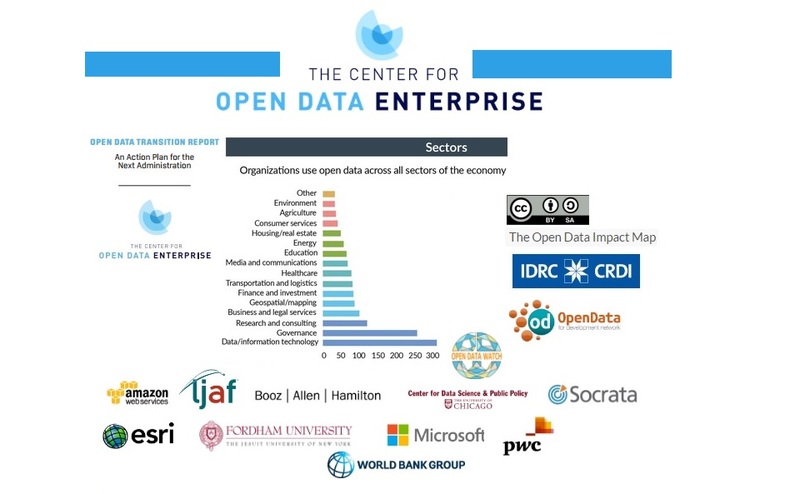 The Center for Open Data Enterprise is an independent nonprofit organization that aims at developing smarter open data strategies to unleash the full power and potential of open data for governments, businesses, and other nonprofits by focusing on data users. exploit the potential and facilitate the use of open (research) data for economic growth, business creation, and optimization in the U.S. and internationally. improve open data based on feedback. Open Data for Public-Private Collaboration: an overview of the issue and possible solutions for government data stewards and other stakeholders interested in the application of open government data (Standards and Interoperability - Strategies for Collaboration). 1. Create public buy-in to encourage landowners to share data. 2. Use common metadata standards like DCAT (Data Catalog Vocabulary) to make it possible to discover and aggregate data from diverse repositories. 3. Develop collaborations for multi-state, multi-university projects. 4. Build agency-based repositories for grantee-generated research and evaluation data, and make the data available to researchers. 5. Streamline data publishing process to decrease barriers by developing a platform for curating data and providing agency assistance to principal investigators in storing data. provides recommendations to improve open data policies and programs moving forward. Goal IV: Help Businesses and Entrepreneurs use Government Data as a Resource. In framing its recommendations, the Report laid out seven principles, saying that Open Data must be: Public – Accessible – Described – Reusable – Complete – Timely - Managed Post-Release. On the website of the Center for Open Data Enterprise you can also freely explore the Open Data Impact Map: a public database of organizations that use open data from around the world, which is a project of the Open Data for Development Network (OD4D). In 2015, the Center for Open Data Enterprise released the Open Data for Business (OD4B) Tool - a methodology to assess the private sector’s current and potential use of government data in various cities, countries, and regions. All resources published on the Center’s website are open to use and re-use under a Creative Commons Attribution-ShareAlike 4.0 International license. For more information about the Center’s plans and activities visit its website, including the Center’s blog section. Additionally, to explore partnership opportunities with the Center, contact Laura Manley at laura@odenterprise.org. To be informed about the Center’s latest work and to receive the Weekly 10 open data stories, subscribe to the Center’s newsletter.